The Moon is a roughly spherical, rocky body orbiting Earth at an average distance of 240,00 miles (385,000 kilometers). It measures about 2,160 miles (3,475 kilometers) across, a little over one-quarter of Earth's diameter. Earth and the Moon are the closest in size of any known planet and its satellite, with the possible exception of Pluto and its moon Charon. The Moon is covered with rocks, boulders, craters, and a layer of charcoal-colored soil from 5 to 20 feet (1.5 to 6 meters) deep. The soil consists of rock fragments, pulverized rock, and tiny pieces of glass. Two types of rock are found on the Moon: basalt, which is hardened lava; and breccia, which is soil and rock fragments that have melted together. Elements found in Moon rocks include aluminum, calcium, iron, magnesium, titanium, potassium, and phosphorus. 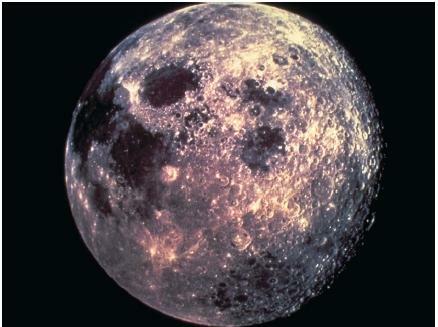 In contrast with Earth, which has a core rich in iron and other metals, the Moon appears to contain very little metal. The apparent lack of organic compounds rules out the possibility that there is, or ever was, life on the Moon. The Moon has no weather, no wind or rain, and no air. As a result, it has no protection from the Sun's rays or meteorites and no ability to retain heat. Temperatures on the Moon have been recorded in the range of 280°F (138°C) to −148°F (−100°C). Both Earth and the Moon are about 4.6 billion years old, a fact that has led to many theories about their common origin. Before the 1970s, scientists held to one of three competing theories about the origin of the Moon: the fission theory, the simultaneous creation theory, and the capture theory. The fission theory stated that the Moon spun off from Earth early in its history. The Pacific basin was the scar left by the tearing away of the Moon. The simultaneous creation theory stated that the Moon and Earth formed at the same time from the same planetary building blocks that were floating in space billions of years ago. The capture theory stated that the Moon was created somewhere else in the solar system and captured by Earth's gravitational field as it wandered too close to the planet. After scientists examined the age and composition of lunar rocks brought back by Apollo astronauts, they discarded these previous theories and accepted a new one: the giant impact theory (also called the Big Whack model). This theory states that when Earth was newly formed, it was sideswiped by a celestial object that was at least as massive as Mars. (Some scientists contend the object was two to three times the mass of Mars.) The collision spewed a ring of crustal matter into space. While in orbit around Earth, that matter gradually combined to form the Moon. The evolution of the Moon has been completely different from that of Earth. For about the first 700 million years of the Moon's existence, it was struck by great numbers of meteorites. They blasted out craters of all sizes. The sheer impact of so many meteorites caused the Moon's crust to melt. Eventually, as the crust cooled, lava from the interior surfaced and filled in cracks and some crater basins. These filled-in basins are the dark spots we see when we look at the Moon. To early astronomers, these dark regions appeared to be bodies of liquid. In 1609, Italian astronomer Galileo Galilei became the first person to observe the Moon through a telescope. He named these dark patches "maria," Latin for "seas." In 1645, Polish astronomer Johannes Hevelius, known as the father of lunar topography, charted 250 craters and other formations on the Moon. Many of these were later named for philosophers and scientists, such as Danish astronomer Tycho Brahe, Polish astronomer Nicolaus Copernicus, German astronomer Johannes Kepler, and Greek philosopher Plato. All Earth-based study of the Moon has been limited by one factor: only one side of the Moon ever faces Earth. The reason is that the Moon's rotational period is equal to the time it takes the Moon to complete one orbit around Earth. It wasn't until 1959, when the former Soviet Union's space probe Luna 3 traveled to the far side of the Moon that scientists were able to see the other half for the first time. Then in 1966, the Soviet Luna 9 became the first object from Earth to land on the Moon. 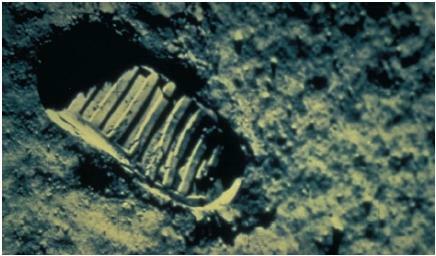 It took television footage showing that lunar dust, which scientists had anticipated finding, did not exist. The fear of encountering thick layers of dust was one reason both the Soviet Union and the United States hesitated sending a man to the moon. Just three years later, on July 20, 1969, U.S. astronauts Neil Armstrong and Edwin "Buzz" Aldrin aboard Apollo 11 became the first humans to walk on the Moon. They collected rock and soil samples, from which scientists learned the Moon's elemental composition. There were five more lunar landings in the Apollo program between 1969 and 1972. To this day, the Moon remains the only celestial body to be visited by humans. In late 1996, scientists announced the possibility that water ice existed on the Moon. Clementine, a U.S. Defense Department spacecraft, had been launched in January 1994 and orbited the Moon for four months. It surveyed a huge depression in the south polar region called the South Pole-Aitken basin. Nearly four billion years ago, a massive asteroid had gouged out the basin. It stretches 1,500 miles (2,415 kilometers) and in places is as deep as 8 miles (13 kilometers), deeper than Mount Everest is high. Areas of this basin are never exposed to sunlight, and temperatures there are estimated to be as low as −387°F (−233°C). While scanning these vast areas with radar signals, Clementine discovered what appeared to be ice crystals mixed with dirt. Scientists speculated that the crystals made up no more the 10 percent of the material in the region. They believe the ice is the residue of moisture from comets that struck the Moon over the last three billion years. of 62 miles (100 kilometers). Then, in December 1998, NASA lowered its orbit to an altitude of 25 miles (40 kilometers). On July 31, 1999, in a controlled crash, the spacecraft settled into a crater near the south pole of the Moon. If there were water at the crash site, the spacecraft's impact would have thrown up a huge plume of water vapor that could have been seen by spectroscopes at the Keck Observatory on Mauna Kea, Hawaii, and other telescopes like the orbiting Hubble Space Telescope. However, no such plume was observed. For scientists, the question of whether there is hidden ice on the Moon, delivered by impacting comets, is still open. It is estimated that each pole on the Moon may contain up to 1 billion tons (900 million metric tons) of frozen water ice spread throughout the soil. I want to think you all for this website. I had a Research Paper to do for science and this website basically wrote my whole paper.